Dates for 2016: Saturday 23rd - Saturday 30th July. The Canal Cruise is for 12-17 year-olds. It involves daily challenges such as learning how to work locks, steering the boat and telling as many jokes as you can. Also, you may win a highly-acclaimed "Silver Nut Award" for the silliest thing that has happened in a given day. 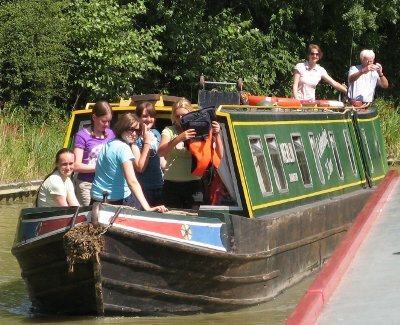 Accommodation is aboard narrowboats (what else would you expect on a canal cruise?) with up to 8 members and 4 leaders per boat. You will sleep in bunks on the same boat each night, but you will cruise on a different boat with a different mix of people each day. There is limited space on a narrowboat so the cabins are quite 'cosy' - you'll know each other well by the end! Each boat has a saloon area for eating and seating and when the weather's nice you can sit on the front deck or stand on the back deck. Here's the official page about the Canal Cruise, which has even more details.